Morro Bay is a delightful small town on the California coast roughly halfway between San Francisco and Los Angeles and noted for the huge Morro Rock. 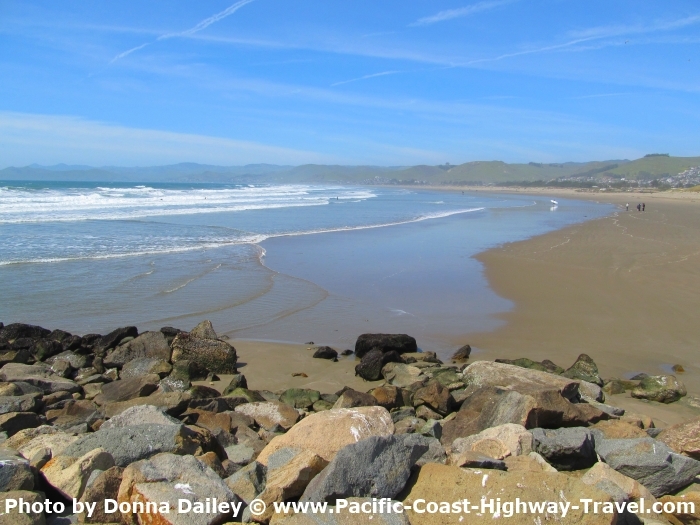 Morro Bay is one of our favorite stops along the Pacific Coast Highway, and we always try to pull in there even if we're not staying overnight. 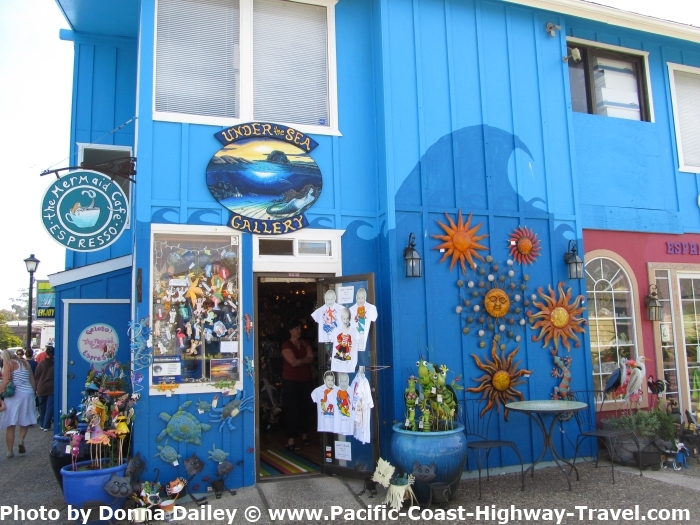 We love wandering around the shops and galleries near the seafront, and then driving out to Morro Rock, watching for sea otters and other wildlife along the way. 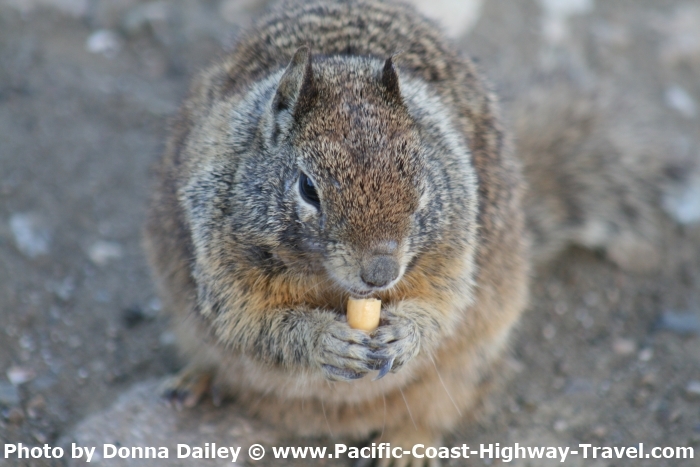 As well as cheeky sparrows and ground squirrels, which are used to being fed by the many visitors, Morro Rock is home to a colony of peregrine falcons, so watch out for those too. It's why access to the rock is not allowed unless you have a special permit. The rock is 576 feet (176 meters) high and has been a Historic Landmark since 1968. It was mentioned by the Spanish explorer Juan Cabrillo when he came through here in 1542, but it has been around a lot longer than that. It owes its existence to a volcanic action that creates what's called a volcanic plug, and there are more of these inland from here. 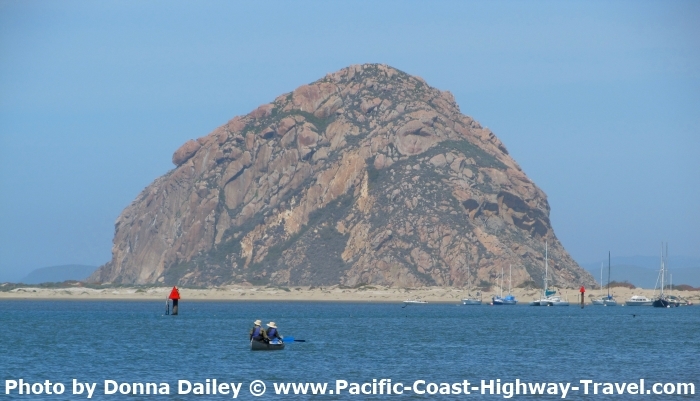 Morro Rock stands out because of its location, and at one time it was completely surrounded by water until the harbor was created. 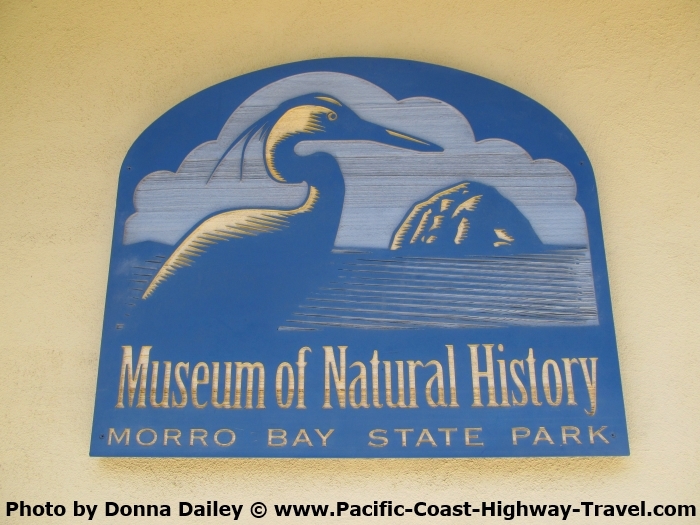 At the south side of the bay is the Morro Bay State Park, which is home to numerous other birds, from dainty waders looking for food to large herons and egrets. 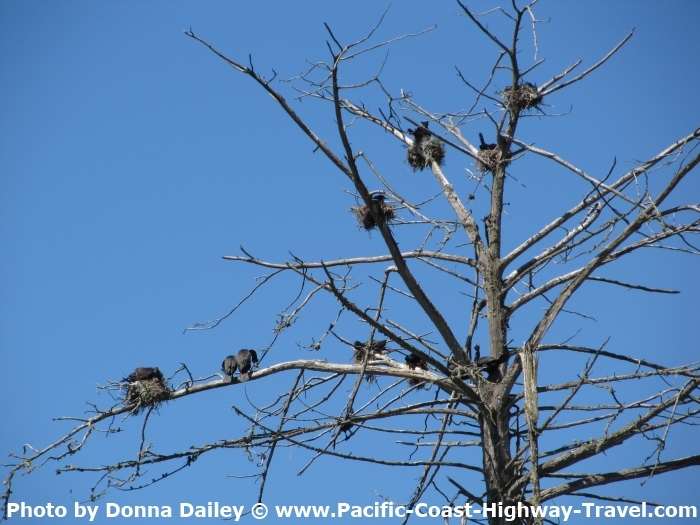 Next to the Inn at Morro Bay is a vast heron rookery. Look up in the trees and you might see the great blue heron, black-crowned night heron, the great egret, and the double-crested cormorant. Just remember not to park underneath the trees! A little further on is the Museum of Natural History, a terrific museum. Although it's fairly small we spent ages inside, looking at the very informative exhibits on local wildlife. They have large models showing the different local habitats, and there are beautiful views too, looking out over the bay and across to Morro Rock. Close by you can rent kayaks if you want to get out onto the water, though keep your eyes open as this is a commercial fishing harbor. You'll be advised to stay within the harbor itself as the waters can be very choppy and the winds fierce around the harbor mouth. 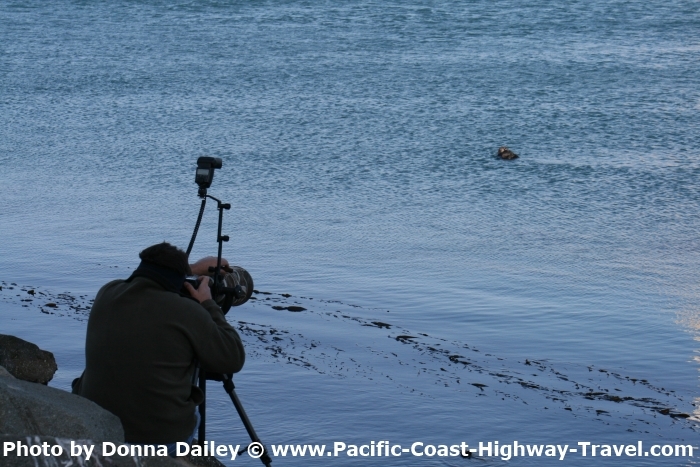 Watch out for sea otters who like to lie on their backs in the water and eat. Their behaviour is fascinating. They dive down into the water looking for clams and other shellfish as well as sea urchins and sometimes fish. They tuck these into a pouch under their arm. The pouch also contains the otter's favorite rock. When they return to the surface they lie on their back, put the rock on their front, and smash open the shellfish on it. You can also see gulls hanging about close to the otter, hoping to grab the food if the otter isn't paying attention. You might also see the otters wrapping themselves in sea kelp. At first we thought this must be to keep themselves warm but we later learned that they are using the kelp as an anchor so they don't drift out to sea if they want to lie in the water and rest or eat. 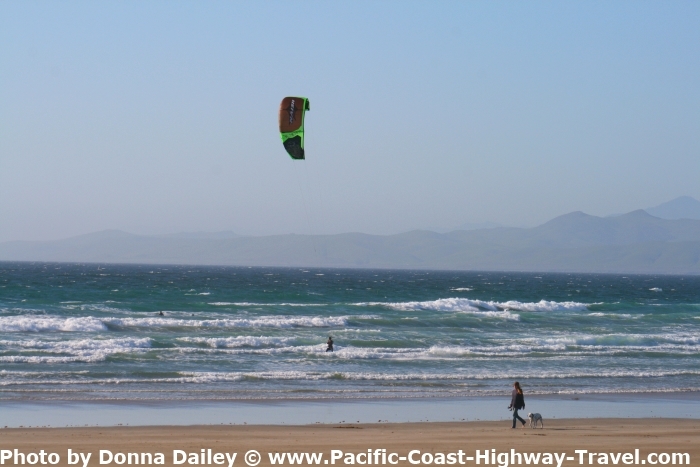 Other than what we've described, there's not a lot to do in Morro Bay and this is one of its charms. It's a bit of an old-fashioned place in a lovely location with a slow pace of life where people have time to stop and talk. 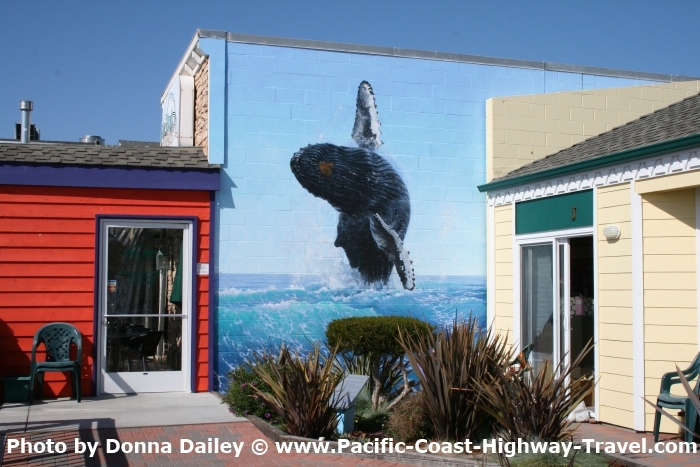 There is a small Maritime Museum, an aquarium, The Morro Bay Estuary Nature Center, a Mural Mile, and the Morro Bay Skateboard Museum. If skateboards are your thing, there are over 200 of them on display here. 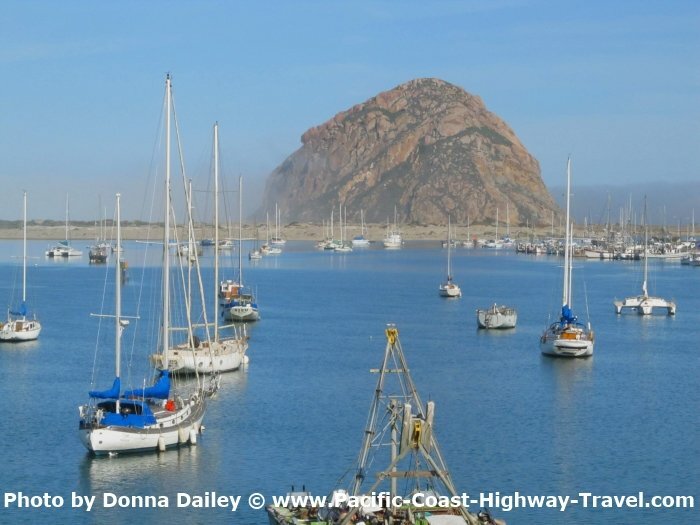 Morro Bay is just over 200 miles from Los Angeles if you drive Highway 101, and you should allow four hours of driving time. 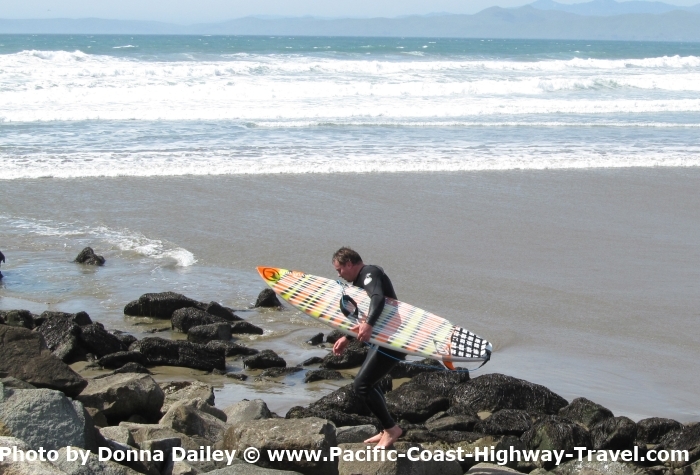 Convenient places to stop on the way include Santa Barbara and Pismo Beach. From San Francisco it's about 240 miles if you take Highway 101, and with normal traffic you should do it in four hours or a little less. To be safe, allow five hours if the traffic is bad. If you want to take Highway 1 along the coast, it's a similar distance but much slower driving - anything from four to seven hours, depending on the traffic. 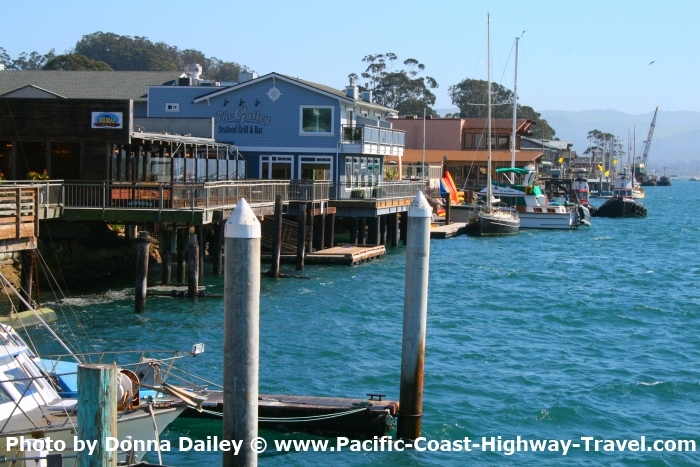 If you have the time and want to make a trip of it, good stopping points include Santa Cruz, Monterey, Carmel, and Big Sur. 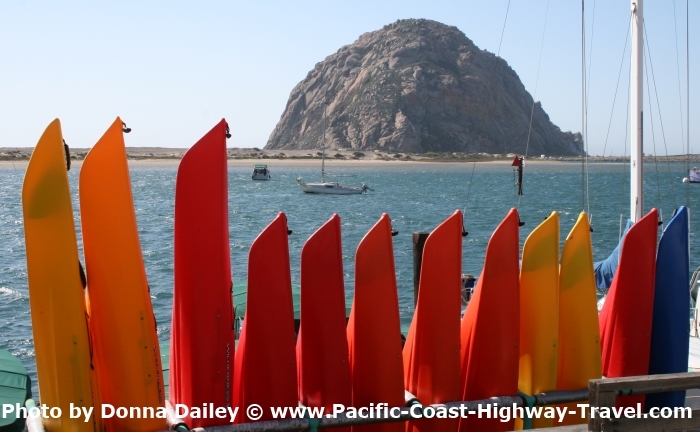 Visit the official Morro Bay website.